The Philippines are made up of around 7,000 islands – which means that water is never far away. But finding fresh water for drinking and domestic use was a real struggle for many poor communities even before Typhoon Haiyan in 2013. In the remote coastal barangay (district) of Tagalag in Marabut town, Samar province fetching water every day was a very time-consuming task for everybody. People would sometimes have to walk to the next barangay with big containers to collect their daily water supply. Many barangays were overwhelmed by ‘storm surge’ during the massive typhoon. This is when huge debris-filled waves of water speeding inland wash away houses, roads and water-supply systems. The serious risk is that the sewage system contaminates water supply and puts people of risk of stomach upsets or even cholera. New water system provided by Caritas in a village in Leyte island. Photo by Lukasz Cholewiak/Caritas. In the immediate aftermath of the disaster, Caritas teams carried out hygiene training as they distributed sanitation kits. Staff encouraged people to maintain the latrines and to collect rubbish. Caritas Philippines (locally known as NASSA) was providing drinking water to 25,000 people in the months after the disaster. 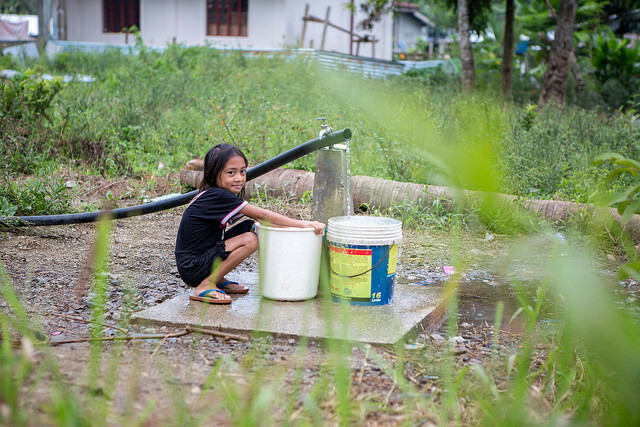 To help Haiyan-affected communities in the long-term, Caritas has provided water supply facilities to areas such as Barangay Tagalag, which never had access to clean drinking water. Working hand-in-hand with members of the community, a level two piped-water system has been installed in the barangay to supply water to 185 households. “The materials used for this piped system are of a good standard so I am confident that this will last a lifetime,” Barangay Captain Manuel Llego said. No more long, exhausting travel with big containers to other barangays for the communities where the piped system was introduced. No more time, energy and money expended. No water, no more.